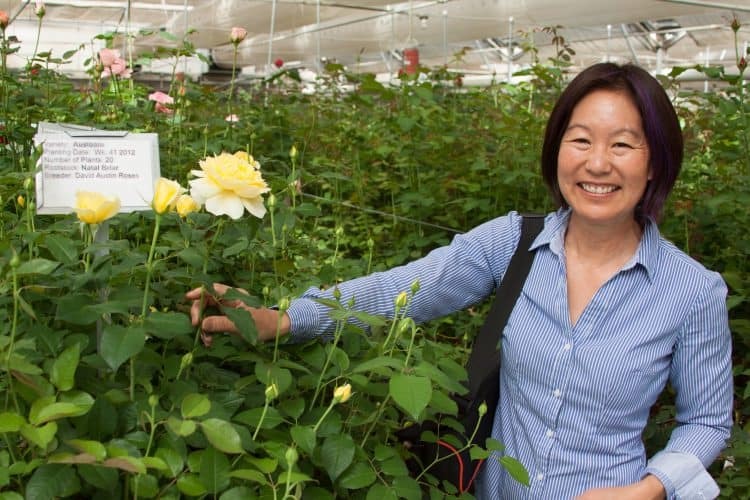 Meet Janet Louie, Sales Manager of Green Valley Floral in Salinas, CA. As a second-generation farmer, she grew up in the cut flower industry and knows the ins and outs of operating a successful nursery. Learn more about Janet, why she says it’s important to have an honest relationship with her employees and why her favorite part of her job is the smiles she brings. Janet: My parents started this business in 1973 and originally began on 10 acres and then expanded to 16 acres of all environmentally-controlled greenhouses. We’ve been fortunate enough to upgrade them to a really nice cooling system with some high tech solar energy as well. It’s been really cool to see the progression of the changes over the years and how much we’ve been able to contribute since I joined in 1989. My husband and I got married in 1990 and he joined the company soon after that, so we’ve been doing this for a very long time. In essence, the four of us all have a role in the company that’s very different and it helps because that’s how you work with family and run a business at the same time. I wouldn’t recommend it if you all had to do the same job together, but luckily we all have our own responsibilities so that helps. We’ve been doing this for 26 years between two couples and we’re still married, so it’s been successful. Janet: We start the day by meeting with our growing managers every morning and that includes sales staff. We go around the room and talk about what the day is going to bring and every department manager comes to that meeting. Then I go to the sales office and get things in order for the day. I help with calls that come in and help wherever I can. Our product is cut flowers and we specialize in garden-style roses, gerbera daisies and lilies. We also handle a number of miscellaneous products that people don’t ship, but we’re able to ship them from our location. We’re able to schedule out our product shipments all week and we’re constantly in touch with customers primarily by phone, but also through email, Skype calls, etc. Janet: Because we offer cut flowers, we have a lot of exposure and requests for flower donations to a number of non-profit organizations that I work with. We give to the Monterey Jazz Festival ever year and recently, we’ve been getting a lot of requests from classrooms. The classrooms that have been calling us have been really great because it’s nice to know that there’s an interest in what’s grown here. We’re one of only six rose growers left in the country, so there’s not many of us left. It’s nice to be able to communicate with people about where their flowers are coming from. I recently did a father/daughter dance where they came and picked up flowers. I also had a request from Meals on Wheels for flowers to help decorate for their events. And Western Service Workers comes in almost every holiday to pick up flowers to display at their tables and give information out about their organization, so we try to give back as much as possible. Janet: Well my parents started the business so I’m part of the second-generation, but I originally went to UC Davis, graduated and thought I was going to do a career in lab work since I was an environmental toxicology major. I took a detour because I wanted to find out more about my origins, so I took some time off and went to Japan and visited my family there. Two years later, I came back and my parents were in a situation where they needed more help in the office. Growing up, I wasn’t really introduced to the business side of it because I did a lot of the work in the greenhouses. So I started helping them out and when I got engaged, my parents asked me to stay for a year or two and give the business a try. My husband and I both ended up loving it. There were a lot of challenges, but he saw a lot of opportunity in those challenges and we were able to really change the landscape of how Green Valley Floral did things. The employees seemed to really understand and wanted to make the changes with us, so there were a lot of significant changes like hydroponic growing, diversifying the crops and changing from only roses to adding gerbera daisies and lilies, which was huge. It also helped that we started to explore other programs that helped with deficiencies. About seven years ago, we joined Veriflora and we became sustainably grown under their certification, which is a really neat program because they teach you so much and have helped us incorporate a lot of great ideas that have helped our business grow. The most significant thing about our business and the reason we still grow roses today is because we met David Austin about 10 years ago and became the only licensed grower of David Austin commercial cut roses. That’s been a really nice boost because we carry a niche product and it allows us to provide a local rose to people who really appreciate it. Janet: I’m an avid hiker and I like to spend time outdoors. I do spend time gardening when I can. I think I’ve traveled enough in our business for research and finding new varieties that I enjoy being at home now. Janet: From my side of it, I’d say finding new products in our industry is really exciting and it’s my favorite part of the job. Farming itself isn’t for everybody and it definitely takes a lot of time. But if you love the product, then you can really get into it. My personal take on it is that we sell beauty and we make people smile, so I love what I do. Janet: Being one of the few rose growers left in the state makes it really unique for us. We’re able to challenge ourselves by finding new varieties and products for our customers every year and that’s one of the goals I have. Janet: We have a great relationship with our employees and we try to be as transparent and honest with them as possible. In turn, they believe in building our team and working together to create an environment where anything can happen and anything is possible. We’ve tried to bring out the best in people and really find out what they can do. Janet: The beauty. You should see what these cut flowers do to people. When you see a beautiful bouquet of flowers, it’s amazing. I love putting the flowers together and seeing people smile when they receive them. Janet: Everything we grow is hydroponic. We’re not really having to work with the soil per se because everything is grown in a media that has all the nutrients it needs through drip irrigation. The unique thing we’ve done is we’ve found a way to utilize solar power on our property and one acre was enough to run it. I’m excited to do more of that this year because we run coolers and I’m able to hopefully get more of that going on. My husband did that one-acre project last year and it was totally unheard of. We went in with a partner company who helped us and we’ve found a lot of success with it. I think the more technology available out there that makes our lives easier and more efficient will be vital to our future.